Topbox is a Canadian company which does monthly subscription boxes, as well as a number of limited edition boxes throughout the year. I used to be a monthly subscriber; even though I have cancelled my subscription, I do buy their limited edition boxes, if the content appeals to me. The content of the Kit's Limited Edition Summer Survival Guide Box did appeal to me, so I bought one. The box shipped mid-August. Honestly, I wish it has shipped earlier so that I could enjoy these products during the summer. By the time I got my box there were only 2 weeks left. Redken Frizz Dismiss FPF Fly-Away Fix Sheets- Described as "dry like sheets", you smooth one over dry hair to combat fly-aways and frizz. The sheets are in the box and not pre-packaged/individually packaged, which makes me wonder how long it will be before they dry out. Also, the box I have is for fine hair, which my hair is not...so I'm serious to see how well they will work. Marc Anthony Hydrating Coconut Oil & Shea Butter Moisture Rich Body Butter Dual Packs- I love the smell of coconut and I hope this smells good- since it's in a foil package, I don't want to open it until I'm ready to use it. We'll see what this product can do for my extra dry skin. Avon MagIX Face Perfecter SPF 20- This primer claims to smooth fine lines. I love that it has SPF 20! That alone will make me use this product. It's thicker than any primer I have ever used, but it did make my skin feel smoother. Evian Brumisateur Facial Spray- I LOVE THIS PRODUCT!!! I have been a fan of Evian Facial Spray for years! This product can be used to set your make-up or to keep you skin hydrated- which is what I use it for. This is by far my favourite product, and the one I am most excited about, in this box. Hawaiian Tropic Silk Hydration Face Lotion SPF 30- This product claims to provide 12 hours of hydration- which I can't wait to test out- and protection from UVA and UVB. It smells like sunscreen, but wasn't nearly as greasy. It did make my skin feel hydrated as soon as it was applied. Illumalift Brightening Cream- This is a Canadian brand, which makes me extra excited to try it. This is supposed to be a primer, that minimizes the signs of aging by enhancing collagen production, while brightening your skin. I'm not sure how I feel about this product...it's kind of like a cream blush and you have to really blend it in, or else you have yellow streaks. It does feel light, which I like. OGX Nourishing Coconut Milk Shampoo- My sister actually uses this shampoo, so I'm looking forward to trying it. It claims to make your hair shine, as well as strengthen it. Saint Cosmetics Eyeshawdow in Lay It Out In Lavender- The packaging is cute, but the colour isn't for me. I would have loved to try one of the other colours they had...basically, any of the other colours would have been more "me" than lavender. Barefoot Venus All Cracked Up Repairing Cocoa Butter Foot Balm- Like the rest of my body, the skin on my feet is super dry and I'm always looking for a product to use on them. I was introduced to this brand by Topbox in another box I got, and feel in love with the brand. Besides the Evian Spray, I am most excited about this product! It smells amazing!! It feels thick to the touch, but it goes on super light. Purology Colour Fanatic Multi-Tasking Hair Beautifier for Colour Treated Hair- I am confused by this product...it's a spray that was 21 functions? I did a little googling to try and figure more out; it "primes, protects and perfects colour-treated hair". Uses include leave in conditioner, hair cutting lotion, detanlger spray, hair cuticle sealer, anti-frizz spray, hair shine treatment... I'm still confused. I guess I'll give this a try and see what happens. Don't remember how much I paid for this box, but it was between $30 and $40. 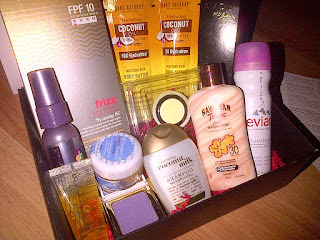 Regardless, this box has a great value, almost $90 worth of products. There are a couple of products I won't use, and a bunch I am excited to try. Overall, pretty happy with this box!! The Marc Anthony coconut line, and the other (which I buy at Costco every now and then) smell and actually ARE nice products.